As some may recall, when the Trickster Rogue Booster Pack launched, the cloak and head pieces were class-bound making them useless for cross-class transmutation. This was inconsistent with other Booster Packs and was eventually fixed. 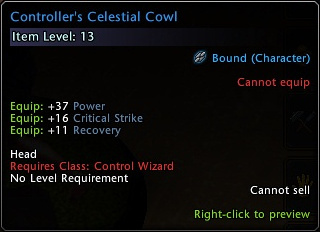 (http://www.arcgames.com/en/forums/neverwinter#/discussion/1213845/) The Controller's Celestial Cowl from the Control Wizard's Booster Pack suffers the same problem. @terramak was very helpful last time. Really, when are these going to get fixed? You don't need god tier programming skills to fix these simple errors. For packs that cost a lot you'd think it would be nice to have had these addressed a LONG time ago. A little appreciation for customers?